After viewing over 50 properties for sale in Destin my sister, Mitzi, and I (Lisa) were sold on SURFSIDE! We were finally realizing a long-time dream and buying a Destin vacation home. And Surfside stood out from the rest... We loved the private sky bridge over Scenic Gulf Drive (No fighting traffic) and the layout of the units. The bedroom/bathroom suites were separated by the fully-equipped kitchen, living room and dining room. We'd seen so many 'shotgun' style units that offered little to no privacy! 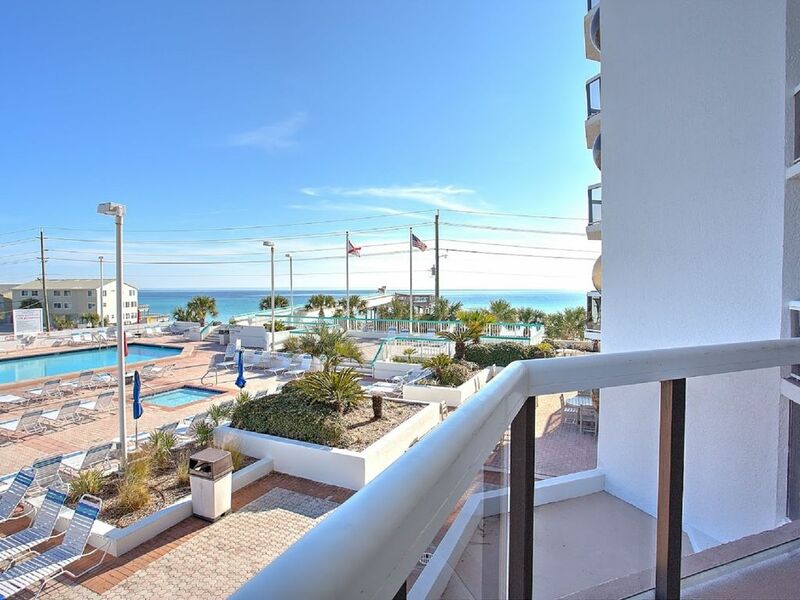 When we walked into one unit on Surfside's third floor, we knew this was our home away from home. Sliding glass doors in both bedrooms, kitchen and living room offered access to the balcony. And WHAT A VIEW! Not only could you see the full-size heated pool, kiddie pool, and skywalk but you could also see that famous emerald green gulf! We can accommodate up to six with a king-size bed in the huge master suite, full-size bed in the second bedroom, and pull-out queen-size couch in the living room. The master bath has a great tiled shower and closet with washer and dryer. The second bath also has a shower. BOTH BATHS AND KITCHEN have been updated ...new tile floors and lighting, new wallpaper in both baths, new cabinets, countertops, range, and microwave in the kitchen. For inside entertainment, there are two flat screen TVs with cable, DVD/Blu Ray player and a CD stereo system in the living room. A breakfast bar between the kitchen and living room seats three and the mirrored dining room with glass-top table seats four. We know you'll love staying at our Surfside home also! Just bring yourself, some clothes and maybe those golf clubs, tennis rackets, or basketballs because everything else you need is here. All linens are provided except for beach towels and the kitchen has all the dinnerware, glassware, utensils, cookware you could need. Appliances include refrigerator, microwave, dishwasher, stove, toaster, blender, coffee pot and ice maker. The condo is 1062 square feet..air-conditioned of course . Sorry, no smoking, no pets and Surfside regulations restrict us from renting to anyone under the age of 25. Surfside offers an extreme amount of amenities...heated pool, kiddie pool, two hot tubs, mens/ladies showers and saunas, sun bathing deck overlooking the ocean, sports deck with tennis, basketball and volleyball courts, BBQ area with picnic tables, interior hallways, some covered parking. PLUS...a newly renovated exercise room! Visit the fabulous Royal Palm Grill inside of Surfside Restaurant. And don't miss the Tiki Hut bar by the pool and beach bar located on the second level of the skybridge tower. courses, attractions, restaurants.. you name it! Along new Highway 98 there's much fun...putt-putt golf, go-carts, arcades, boutique shopping, water parks, cinemas. On the beach you can rent jet skis, wave runners, go para-sailing. Other fun things to do in Destin... Boating, Sailing, Dolphin-watching, Surfing, deep sea fishing, and more. ATTENTION GOLFERS...there are 8 courses within 5 miles of Surfside! Not much that isn't here! IF YOU WISH TO RESERVE THIS VACATION CONDO, PLEASE CONTACT THE OWNER DIRECTLY VIA EMAIL OR PHONE. Surfside is located across the street (2 lanes) from the beach. No buildings on the beach as we own it. Great view from inside the condo and from the balcony. Stacked full size washer/dryer in master bath closet. Private ladies and mens sauna in the pool house. A full size and a kiddie size pool onsite. Full size pool is heated in the winter. Exercise Room, Sports Deck, spa and beauty salon! Fabulous Royal Palm Grille full service restaurant and bar on site. Beach bar located on the first floor of the beach tower and an seasonal pool bar. The condo was very nice, and the resort was also very nice and keep in great condition. Its located close to everything you could need. Also the resort is just across the road from the beach . I would recommend to anyone as a great place to stay. Renee from Tuscaloosa, Roll Tide Roll !!! Our family of 5 (our two grown daughters, one son-in-law, my husband and myself) rented the Surfside Sister's condo. We had a very pleasant experience during our stay. We were sent detailed information about the condo. Everything was just as it was advertised. We enjoyed the beach, the private access to the beach, two lounge chairs and umbrella that came with the condo, the bonfire that was on the beach after dark for Surfside guest, swimming pool and parking deck. The condo was very clean and well kept. It seemed that most of the guest were families. I would highly recommend the Surfside Sister's condo. Great location and very affordable. Great condo! Would recommend to anyone traveling in Destin area! Condo was exactly as advertised. It had everything we needed for an excellent vacation. Beautiful view of the Gulf, plenty of room, a fantastic kitchen. We really enjoyed our time here! Location was great! 2nd floor level was perfect bc our 3 year old HATES elevators!!!!!! Really clean, loved the view of the ocean. Had all the amenities we needed. Will definitely be back. Lisa answered all of our questions very promptly! IF YOU WISH TO RESERVE, PLEASE EMAIL OR CALL ME FIRST. Minimum stay 3 nights. Must be 25 or older to rent this unit.